The praenomen (Classical Latin: [ˈprae̯:.noː.mɛn]; plural: praenomina) was a personal name chosen by the parents of a Roman child. It was first bestowed on the dies lustricus (day of lustration), the eighth day after the birth of a girl, or the ninth day after the birth of a boy. The praenomen would then be formally conferred a second time when girls married, or when boys assumed the toga virilis upon reaching manhood. Although it was the oldest of the tria nomina commonly used in Roman naming conventions, by the late republic, most praenomina were so common that most people were called by their praenomina only by family or close friends. For this reason, although they continued to be used, praenomina gradually disappeared from public records during imperial times. Although both men and women received praenomina, women's praenomina were frequently ignored, and they were gradually abandoned by many Roman families, though they continued to be used in some families and in the countryside. Italy developed the first true surnames, or cognomina. At first these were generally personal names, and might refer to any number of things, including a person's occupation, town of origin, the name of his or her father, or some physical feature or characteristic. But gradually an increasing number of them became hereditary, until they could be used to distinguish whole families from one generation to another. As this happened, the word nomen came to be applied to these surnames, and the original personal name came to be called the praenomen, or "forename", as it was usually recited first. Cognomen came to refer to any other personal or hereditary surnames coming after the family name, and used to distinguish individuals or branches of large families from one another. As the tria nomina developed throughout Italy, the importance of the praenomen in everyday life declined considerably, together with the number of praenomina in common use. By the 1st century they were occasionally omitted from public records, and by the middle of the 4th century they were seldom recorded. As the Roman Empire expanded, much of the populace came from cultures with different naming conventions, and the formal structure of the tria nomina became neglected. Various names that were originally nomina or cognomina came to be treated as praenomina, and some individuals used several of them at once. However, some vestiges of the original system survived, and many of the original praenomina have continued into modern times. 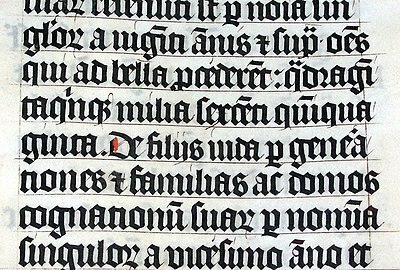 Most common praenomina were regularly abbreviated in writing (in speech the full name would always be used). Although some names could be abbreviated multiple ways, the following tables include only the most usual abbreviation, if any, for each name. These abbreviations continue to be used by classical scholars. Latin praenomina Each of the Italic peoples had its own distinctive group of praenomina. A few names were shared between cultures, and the Etruscans in particular borrowed many praenomina from Latin and Oscan. It is disputed whether some of the praenomina used by the Romans themselves were of distinctly Etruscan or Oscan origin. However, these names were in general use at Rome and other Latin towns, and were used by families that were certainly of Latin origin. Thus, irrespective of their actual etymology, these names may be regarded as Latin. Masculine names In the early centuries of the Roman Republic, about three dozen praenomina seem to have been in general use at Rome, of which about half were common. This number gradually dwindled to about eighteen praenomina by the 1st century B.C., of which perhaps a dozen were common. Latin alphabet was derived) but not otherwise used in Latin. The apostrophe is used as a substitute for this letter. Octavius (with an i) seems to be the only form of this name found as a praenomen, although the form Octavus would be consistent with the adjective from which the name is derived. Volero, a praenomen used by the Publilii, is believed to be a variant of Volesus. Some of the praenomina in this list are known from only a few examples. However, the overall sample from which they have been taken represents only a small fraction of the entire Roman populace. The Realencyclopädie der Classischen Altertumswissenschaft mentions about ten thousand individuals whose praenomina are known from surviving works of history, literature, and various inscriptions. These individuals are spread over a period of over twelve centuries, with the smallest sample coming from the early Republic, when the greatest variety of praenomina was in use. During that same period, the sample consists almost entirely of Roman men belonging to the leading patrician families. Many of the names which were uncommon amongst the patricians appear to have been more widespread amongst the plebeians, and the appearance of rare names in Latin inscriptions outside of Rome suggests that many names which were uncommon at Rome were much more common in other parts of Latium. Feminine names In the earliest period, both men and women used praenomina. However, with the adoption of hereditary surnames, the praenomen lost much of its original importance. The number of praenomina in general use declined steadily throughout Roman history, and as most families used the same praenomina from one generation to the next, the praenomen became less useful for distinguishing between individuals. Women's praenomina gradually fell into disuse, and by the first century the majority of Roman women either did not have or did not use praenomina. A similar process occurred throughout Italy, except amongst the Etruscans, for whom feminine praenomina were the rule. The abandonment of women's praenomina over time was more the result of practical usage than a deliberate process. Because Latin names had both masculine and feminine forms, the nomen itself was sufficient to distinguish a Roman woman from her father and brothers. Roman women did not change their names when they married, so a Roman wife usually did not share her nomen with any other members of her family. Diminutives, nicknames, and personal cognomina could be used to differentiate between sisters. When there were two sisters, they were frequently referred to as Major and Minor, with these terms appearing after the nomen or cognomen; if there were more than two, the eldest might be called Maxima, and the younger sisters assigned numerical cognomina. Many of the cognomina used by women originated as praenomina, and for much of Roman history there seems to have been a fashion for "inverting" women's praenomina and cognomina; names that were traditionally regarded as praenomina were often placed after a woman's nomen or cognomen, as if a surname, even though they were used as praenomina. The reverse was also common, especially in imperial times; a personal cognomen would be placed before a woman's nomen, in the place of a praenomen. In both cases, the name was functionally a praenomen, irrespective of its position in the name. For this reason, it is often impossible to distinguish between women's praenomina and personal cognomina. In imperial times, Roman women were more likely to have praenomina if they had several older sisters. A daughter who had been called simply by her nomen for several years was less likely to receive a praenomen than her younger sisters, and because it was usually easy to distinguish between two daughters without using praenomina, the need for traditional personal names did not become acute until there were at least three sisters in a family. Tertia and Quarta were common praenomina, while Secunda was less common, and Prima rarer still. Maxima, Maio, and Mino were also used as praenomina, although it may be debated whether they represent true personal names. Paulla was probably given to younger daughters, and was one of the most common praenomina. Most other women's praenomina were simply the feminine forms of familiar masculine praenomina. Examples are known of all common praenomina, as well as a number of less-common ones. Only in the case of praenomina which had irregular masculine forms is there some uncertainty; but these probably became feminine by taking diminutive forms. Caesula or Caesilla appears to have been the feminine form of Caeso, and the personal cognomen Agrippina probably represents the feminine form of Agrippa. Two notable exceptions to the usual formation are Marcia and Titia, both of which regularly formed as "i-stem" nouns, instead of the expected Marca and Tita (although those forms are also found). Feminine praenomina were usually abbreviated in the same manner as their masculine counterparts, but were often written in full. One notable exception occurs in the filiations of liberti, where the abbreviation "C." for Gaia was frequently reversed to indicate the freedman of a woman. Here the name "Gaia" seems to have been used generically to represent any woman, although in some instances an inverted "M." for Marcia seems to have been used as well. The following list includes feminine praenomina which are known or reasonably certain from extant sources and inscriptions, and which were clearly used as praenomina, rather than nicknames or inverted cognomina. Several variations are known for some praenomina, of which only the most regular are given in this table. The abbreviations are usually the same as for the corresponding masculine praenomina; where variation exists, only the most common abbreviation has been provided. A few of these names were normally written in full, or have not been found with regular abbreviations. Maio and Mino are the forms usually found as praenomina, although Major and Minor are also found. As cognomina, Major and Minor seem to have been preferred. Secunda was usually abbreviated Seq., although Sec. is also common. In archaic Latin, C was used primarily before E and I, while Q appeared before O and U, and K before A. In a few instances the name is written Sequnda. Italy into their sphere of influence. Umbrian praenomina are less well-known, but appear to have been similar to those of the Oscans. Although it is widely believed that the Latin praenomen Mamercus was of Oscan origin, since Mamers was a Sabine form of Mars, it is not clear to what extent the two cultures (which sprang from the same origin) borrowed praenomina from one another, and to what extent they shared names based on roots common to each language. It is impossible to provide a complete list of Oscan praenomina, but these names are clearly identifiable in extant histories and inscriptions. Abbreviations do exist for some of them, but they were less regular, and less regularly employed, than the Latin abbreviations. The -ius ending found in Latin sources is frequently found as -is or -iis in Oscan inscriptions. Ancus is known from only two sources: Ancus Marcius, the third King of Rome, who was of Sabine ancestry, and Ancus Publicius, an early member of a plebeian gens. Attius may be the Oscan equivalent of the Latin praenomen Appius, since the Sabine Attius Clausus took the name Appius Claudius upon settling at Rome; however, it could also simply have been the closest praenomen in sound. Decius, Pompo (and variations thereof), and Seppius are the Oscan equivalents of the Latin praenomina Decimus, Quintus, and Septimus. A 'P' in Oscan frequently corresponded to a 'Q' in Latin. Nerius, or Nero, a praenomen common to Oscan and Umbrian, was said to mean fortis ac strenuus, that is, "strong" or "vigorous". 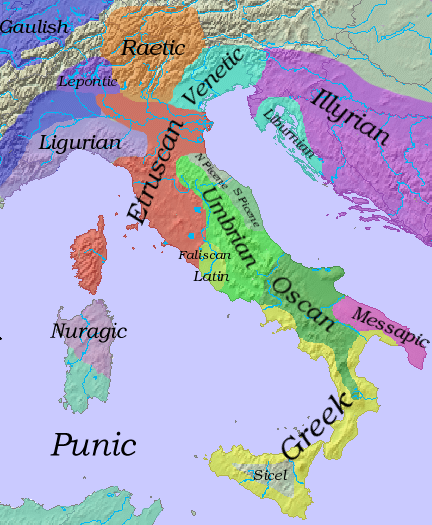 The Romans rendered Lar, Larce, Laris, and Larth all as Lars. Aule, Cae, Cneve, Lucie, Mamarce, Marce, Metie, Pavle, Puplie, Spurie, Tite, Thefarie, Uchtave, and Vipie may be recognized as the Latin praenomina Aulus, Gaius, Gnaeus, Lucius, Mamercus, Marcus, Mettius, Paullus, Publius, Spurius, Titus, Tiberius, Octavius, and Vibius. There is no agreement on whether any of these were borrowed from Etruscan, or whether all were originally Latin. The Etruscans used a number of diminutives for both masculine and feminine names, including the masculine names Arnza (from Arruns), Venel, and Venox (from Vel). Fasti may be borrowed from the Latin praenomen Fausta. Hasti may be a variant of the same name. An example of a diminutive of a feminine praenomen is Ravntzu (from Ranvthu).